what if you could learn how to become a confident watercolor artist in a fun, relaxed environment? AKA, at home. with a glass of rosé. 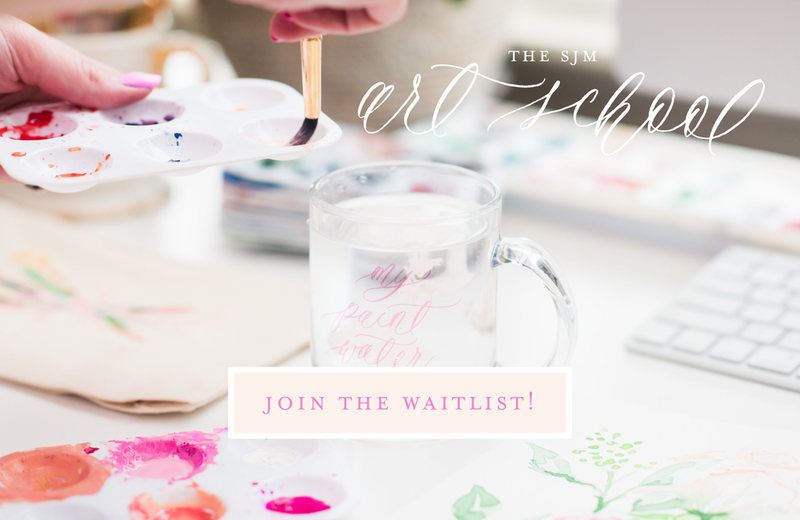 be the first to become an sjm art school student the next time enrollment opens! want to be the first to get access to grab the early bird seats when doors open up again...and start practicing free weekly watercolor tutorials while you wait? it's an online artistic classroom for budding artists to learn artistic fundamentals & advanced techniques in a fun, yet-relaxed environment. It's lifetime access to go-at-your-own-pace courses with an online community and step-by-step PDF worksheets and homework. it's your next step toward becoming an artist. and a confident one at that! click here to get that creative freebie i promised ya at the end of the video! 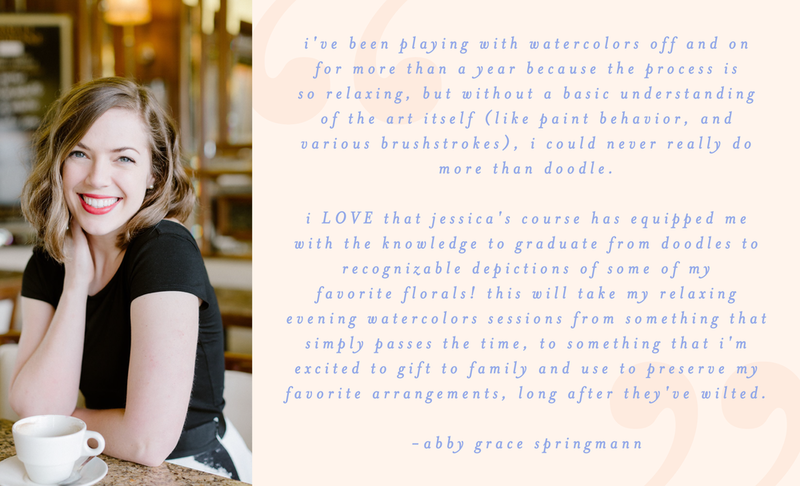 the 4 courses in the sjm art school will provide you with a strong watercolor foundation so you can feel confident mastering the ins-and-outs of this beautiful & relaxing art form! in each of the 4 courses? 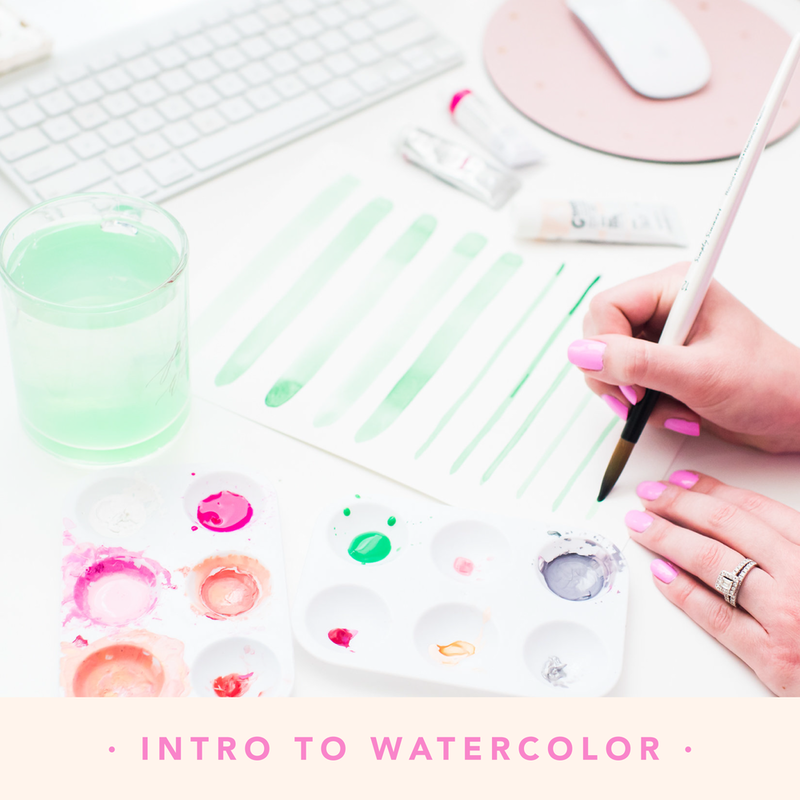 The Intro to Watercolor course will provide you with a strong watercolor foundation so you can feel confident mastering the basics of this beautiful & relaxing art form! It's perfect for beginners, and even for kiddos! The Watercolor Florals course will provide you with a strong grasp on the basics of watercolor, will teach you how to take simple shapes to create petals and leaves, and will teach you how to paint 16 unique florals and a full bouquet painting! The Intro to Brush Calligraphy course will provide you with a strong grasp on the basics of calligraphy, allow you to master the upper & lowercase alphabet, and confidently connect letters to make words & phrases! The Digitizing Watercolors course will provide you with my step-by-step process to create high-quality, crisp watercolor designs that accurately match your original paintings & brush calligraphy. Designs you're confident to share and sell! oh gosh, i forgot my manners!! and i'll be your teacher! I'm an artist for couples, and an educator for artists. And the best news? I'm a self-taught artist, so I know exactly what you're going through! I help budding artists like you build their creative confidence through comprehensive yet simple step-by-step classes. And I'm all about learning with a cup of coffee in the morning or a glass of wine at night! Over the past 4 years, I've taught over 500 students through in-person watercolor workshops. I LOVE teaching in-person, but know that not everyone can travel to be in the cities where I host my workshops! Which is why I'm SO excited to bring the SJM Art School online, so you can take the classes from the comfort of your home - whether that's a hop skip and a jump away in another Texas city, or all the way in Australia! I've built my business on watercolor & brush calligraphy. But it wasn't always that way. I started my career as an assistant to a (super super sweet!) wedding planner. While my job was visually creative, I craved the opportunity to make more with my hands. With paint. So when my (now hubby, Zack!) popped the question and asked me to move from Nashville to Knoxville, I took the leap to create a full-time business and a life I adore that's fueled by art and love. And I haven't looked back since. So whether you're craving a job change to something more creative and hands-on, want to enhance your current creative business by adding brush calligraphy to your products or services, or simply need guidance getting started, the SJM Art School will provide you with the education, confidence, and community you deserve! will i see you in class next semester? all of the gorgeous photos on this page (aside from the fun student headshots!!) were either taken by miss callie lindsey, or shot for the sc stockshop!